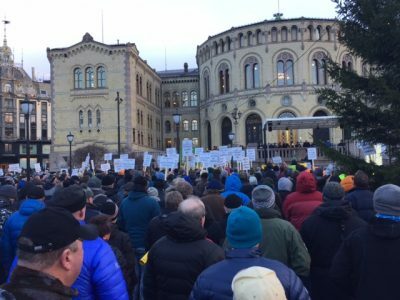 Hundreds of people who feel threatened by the roughly 68 wolves now roaming around eastern Norway turned out for a noisy demonstration in front of the Norwegian Parliament on Wednesday. They were protesting the government’s refusal to kill 47 of the wolves, and aren’t satisfied that only 15 will be subject to a hunt. 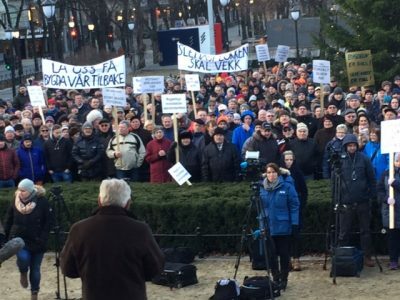 The protesters directed their anger at the government minister in charge of environment and climate issues, Vidar Helgesen, who is under enormous pressure to reinstate the wolf hunt in full. He met shortly thereafter with their representatives from the Norwegian farmers’ organization (Norges Bondelag), the hunters and fishing organization (Norges Jeger- og Fiskeforbund) and local politicians from Hedmark and other areas where wolves have been reintroduced into the nature after nearly becoming extinct in Norway. Helgesen listened to the claims from those who believe the wolves pose a threat and are disrupting economic and recreational pursuits. Among the protesters are forest- and other land-owners who can earn well by charging for moose and other wildlife hunting on their grounds, and fear the wolves threaten both the moose, the hunters and their dogs. Helgesen, however, stood by the decision he announced on December 20 that the state can’t legally allow more wolves to be shot than it already has. That’s “rubbish,” according to one of the many demonstrators outside Parliament on Wednesday. They don’t buy Helgesen’s argument that the wolves don’t pose a threat great enough to justify a hunt, under terms of international treaties Norway is obliged to follow. The full hunt of 47 wolves that had been approved earlier by regional authorities, and which Helgesen reversed, also met protests from around the world. Conservationists had presented Helgesen with some 60,000 signatures of people opposed to the hunt last year. 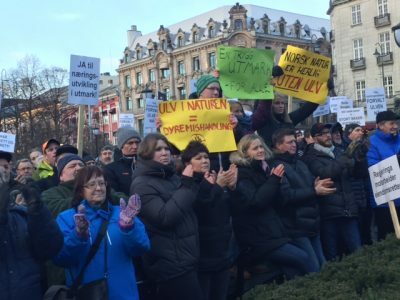 That’s a lot more than the hundreds who turned out in Oslo on Wednesday but they had little regard for the opinions of environmentalists or people living outside Norway. They were most concerned about the presence of wolves in their communities and on their property. The Norwegian protesters who traveled into Oslo from Hedmark, Østerdalen, Trøndelag and Trysil among other rural areas called Helgesen’s limits on the wolf hunt “disrespectful” and “arrogant.” Their signs stressed that they have grazing and hunting rights that must honoured, that grazing areas are one of Norway’s biggest resources and that “Hunting is culture and business.” A majority of the protesters were middle-aged and older men, with only a few women spotted in the crowd. Some spoke, though, including a mother from Trysil who complained that her family’s quality of life had deteriorated since they’d become almost afraid to go outdoors. “Everyone knows that the wolf is not a threatened species,” declared another male speaker, to spirited applause. 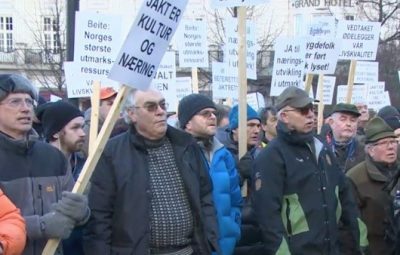 A farmer from Trøndelag spoke while other men held up posters behind him of bloody sheep who’d been victims of attacks by predators. Yet another man seemed to resort to threats against Helgesen and the government. Their protest “is not ending here,” he declared. “It’s here it’s beginning.” Helgesen, of the Conservatives, was also meeting Wednesday afternoon with representatives of the other parties in Parliament that had settled on a compromise regarding wildlife management, as they sought to reduce the level of conflict.